You respond to an unknown chemical emergency at a high school gymnasium. When you arrive on the scene, you are confronted with multiple victims who have signs and symptoms of a chemical exposure. Approximately fifteen victims presenting with blurry vision, watery eyes, runny nose, and nausea approach you. One of the victims reports that the chemical smells like a greenhouse or a lawn and garden store, and another victim says it has a pesticide odor. There are reports of additional victims inside. Initial estimates are 800 – 1,000 people in attendance of the Friday night basketball game. You have a good reason to believe this could be an intentional chemical release, maybe a high school prank gone wrong, or worse, an international terrorism event. There are a multitude of command and control functions that have to occur: rescue, treatment of victims, and decontamination considerations. Control of the overall scene is going to be difficult but will eventually occur with the help of local law enforcement. Having an account for all those in attendance and those who have left the property is impossible. You set up a treatment/transport area and send a search team in for the remaining victims. You have the dispatcher notify area hospitals of victims who maybe en route in private vehicles. How are you going to address decontaminating multiple patients and keep your crews safe from a secondary exposure? Your last decontamination training for a multi-casualty event consisted of master streams at a low pressure fog, either positioning the discharges from engine companies to spray potential victims, or a stream from a ladder pipe. People from the same local high school drama club were recruited to play the role of victims during your disaster exercises, and they all went through a gross decontamination process with large gallonage fire streams. The training exercises were conducted in the warm weather with the victims being clothed in a swimming suit, or shorts and a t-shirt. Going back to our scenario with dozens if not hundreds of people in need of decontamination, how easy is it going to be if the ambient temperature is 40 degrees, and a wide age range of victims with varying degrees of baseline clinical condition? The Doff-it® Personal Privacy Kit contains a privacy garment, collection bag for contaminated clothing, clear sealable bag for valuables, foot covers, moist towelettes, paper towel, and pen. A water temperature at 68 degrees is going to be uncomfortable enough that victims will not tolerate a shower for very long. With tap water approximately 50 degrees and low ambient temperatures, suddenly throwing water on them could increase a victim’s heart rate and blood pressure, resulting in a heart attack to someone who is vulnerable. Most contamination is on the victims’ clothes. To have victims go through a decontamination shower with their clothes on could possibly spread the contamination. How about getting the victims’ clothing off? If the majority of the contamination is on the victims’ clothes, it’s believed we can remove 75% – 90% of the containment just by stripping off the clothing. Stripping conscious victims of their clothes is going to be a difficult situation. Lawsuits for not providing adequate enough privacy during decontamination have been won against fire departments. What are your options? How can you safely treat and transport these victims without becoming symptomatic as well? While 85 degree water is considered the ideal, it’s not possible for most fire departments to deliver without specially designed units or heaters. The first step to the decontamination process is to remove the victim from the area of contamination; fortunately, most ambulatory victims remove themselves before our arrival. The second step, and often times the most important step, is to get the victims’ clothes off, and the final step is a soap and warm water decontamination shower. Providing for privacy can be a difficult challenge. Holding up blankets may not fully cover the victim and allows the firefighters too close to the victim. Setting up screens doesn’t provide privacy around taller buildings and can be difficult in the wind. Allowing the victim inside of a building to change contaminates the building, and in addition, being inside an enclosed area accumulates vapors. The best and quickest method of getting patients out of their clothes, thus providing a very important step of the process, is the decontamination Doff-it® Personal Privacy Kit. The Doff-it Kit has everything you need for patient privacy and also allows the patient to contain their own clothing, which is often times the worst of the contamination. 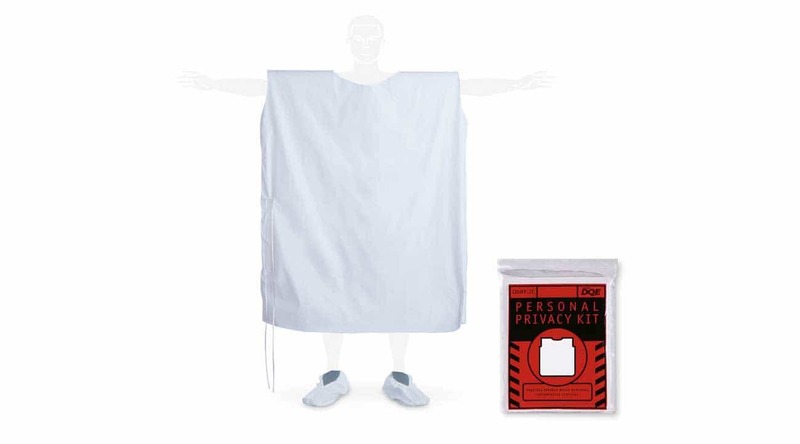 Inside a personal privacy kit is a large poncho that the patient slips on once they take their outer layer of clothing off, such as jackets and sweatshirts. Once the gown is slipped on, the patient will take their shirt off first while maintaining privacy. Once they disrobe their shirt, the pants will come off next. Taking the shirt off first allows the patient to not worry about the gown riding up and exposing themselves. Once the clothes are off, the victim has two bags: one for their clothes, and the other for valuables, such as keys and cell phones. At this point we don’t need to decide what gets returned, but if items do get returned, having the non-porous items such as keys and cell phones in a separate bag will be helpful. Looking at the scenario again with the availability of Doff-it Kits, the ambulatory victims can be quickly sent to a triage area outside the building. For those victims who don’t have liquid or solid contamination, we can quickly get them into a personal privacy kit and transport immediately. For those victims who have a liquid or solid contamination, we need to find a way to give a soap and water decontamination shower, and we can start with clothing removal easily. Very few victims will actually be contaminated with a liquid or solid substance, but for those who are, we can concentrate our efforts and try to come up with another solution other than using cold fire streams. Doff-it Kits can easily be stored in a small amount of space and can be self-administered by most patients. It’s the quickest and most practical method of conducting a mass decontamination while providing for privacy and keeping firefighters at a safe distance.